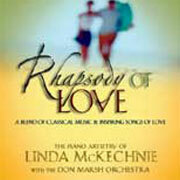 On Rhapsody of Love, pianist, arranger and recording artist Linda McKechnie expresses the grandeur, beauty and inspiring nature of love. 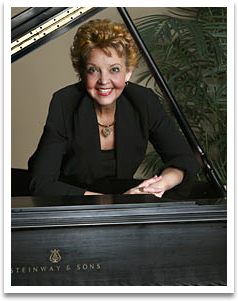 McKechnie's unique musical gift has made her one of the top best-selling instrumental artists in Christian music. In her signature style, Linda has created innovative instrumental arrangements, blending familiar songs of Christian love — from traditional hymns to contemporary love songs — with powerful classical compositions of the masters, such as Schumann, Beethoven and Debussy. Featuring an exquisitely played grand piano and the beautiful orchestrations of producer Don Marsh, the music is magnificent and emotional, connecting the listeners to one another and touching them with the majesty of God. So, whether you're cherishing a new romantic love, planning a wedding, or remmebering vows made long ago, Rhapsody of Love is the music to communicate and nourish your feelings. Listen and share this music that resonates with faith, joy and a celebration of love that endures. For other options in performing these piano arrangements, review the categories under "published music"- to include CD tracks, orchestrations, and other instruments. Please note: published music is not available for "If", "One Hand, One Heart", and "The Prayer".